If you don’t believe me, bear in mind that these words are G. G. Simpson’s — in fact, these are the opening words of the first chapter in Tempo and Mode in Evolution. My work attempts to answer this question. To do this, I use empirical studies of macroevolutionary rates, and develop new methods for studying macroevolutionary pattern and process. Most of my current research focuses on members of the mammalian order Carnivora. Carnivores are a great system for these kinds of studies because they are diverse, have a well-resolved phylogeny, are ecologically and morphologically diverse, and have a great fossil record. I’m currently studying differences in macroevolutionary signal that come from body size and ecomorphological data, and from univariate and multivariate approaches. Most of my work to date has looked at craniodental morphologies associated with diet, but I’m also investigating post-cranial morphologies associated with locomotor behavior. 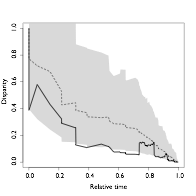 A disparity-through-time plot for cetacean body size. The shaded area shows expectation under a constant rates process while the solid line shows the real data. The real data are significantly different from the constant rates process, indicating that rates of body size evolution slow through time. R code to reproduce this plot is available on my “code” page. One much-cited empirical study from my post-doctoral work with Mike Alfaro at UCLA looked at lineage and trait diversification in living cetaceans (whales, dolphins, and relatives. We found that, although there is no evidence for an early burst of lineage diversification (as expected in an adaptive radiation), there is evidence for an early burst of body size evolution. We suggested that trait data might retain the signal of adaptive radiation after equilibrium dynamics have erased the signal from the structure of a phylogeny. This promising result suggests that studies of the dynamics of trait evolution should be a fruitful avenue for further research. In the course of my work I’ve developed several new comparative methods for studying macroevolution. Most methods are or will be integrated into the popular R library, geiger, by Luke Harmon. I also post code and functions to my code page. MECCA, which I developed as part of my post-doc work with Mike Alfaro and Luke Harmon, is a method that uses a hybrid likelihood / approximate Bayesian MCMC sampler to sample diversification rates and rates of trait evolution using incompletely sampled data. At present, MECCA can be used to fit Brownian motion models, including models with clade specific rate shifts, directional trend models and early burst models. However, the MECCA approach is incredibly flexible and as long as data can be simulated under a model, it can be fitted to comparative data. This contour plot of Akaike Weights from my paper with Matt Pennell shows just how difficult it is to detect early bursts in comparative data. Matt Pennell and I have developed a posterior predictive simulation approach for assessing adequacy of the fit of an early burst model to comparative data. Our approach makes use of two metrics — the Morphological Disparity Index of Harmon and Colleagues, and the Node Height Test slope of Freckleton and Harvey. 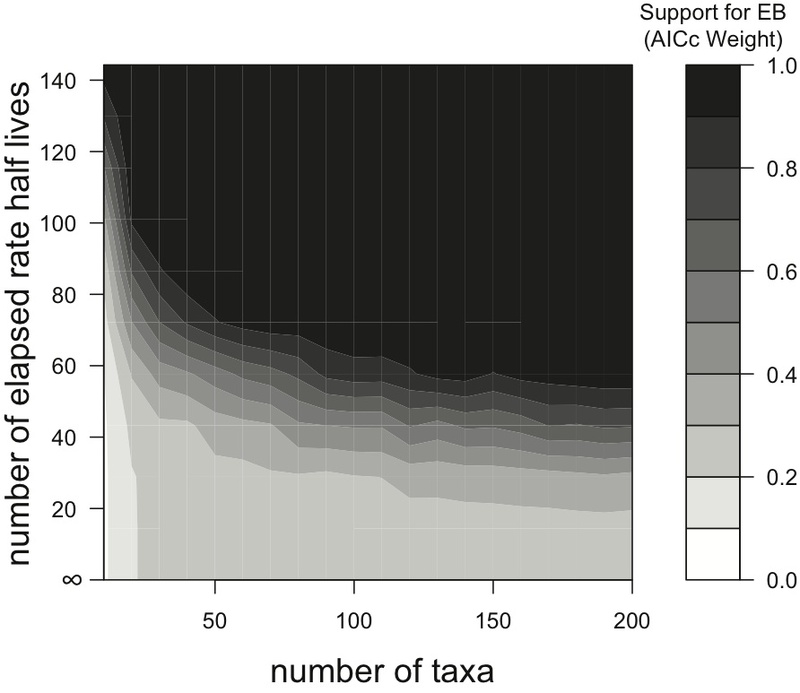 We also make use of a robust regression procedure that down-weights outlier taxa in comparative data when assessing the fit of an early burst model. We’ve found that this approach performs very well with simulated datasets and the cetacean dataset from my 2010 paper. Our study is in press at Systematic Biology right now. A preliminary pdf is provided on my publications page too, if you want to check it out.